An orthogonal anaerobic respiratory pathway that uses metals and metal oxides as terminal electron acceptors. EET is important in a number of fields ranging from biogeochemistry to human health. The reduction and oxidation of iron oxides partially controls the transport of iron in the biosphere. Subsequent iron uptake and use in nitrogen fixation and carbon oxidation influences the nitrogen and carbon cycles. Anaerobic respiration and EET can be used for generating power in microbial fuel cells. Alternatively, reducing equivalents can be supplied via an electrode to enhance the synthesis of reduced metabolites. In anaerobic environments, such as the gut lumen, there is intense competition for respiratory electron acceptors, including metal species. Pathogens can gain a selective advantage using these acceptors. Electroactivity allows microbes to interface with a variety of biotic and abiotic systems, including biofilms, fuel cells, and (in)organic materials. Although many EET proteins and metabolites are well-studied, relatively few tools are available to manipulate their function. Thus, chemists and engineers have limited control over biological electron transfer in many applications. To address this, we aim to adapt synthetic biology strategies in the model electroactive bacterium, Shewanella oneidensis. By regulating the expression of key S. oneidensis EET genes with stimuli-responsive genetic circuits, we hypothesize that the magnitude and timing of EET outputs (e.g., Fe(III) reduction, electrical current, redox catalysis) can be drastically modulated. The performance of engineered circuits can be assayed by high-throughput screening and selection methodologies, enabling isolation of bacterial strains with optimal bioelectrical properties. Our designed EET constructs can be integrated with more sophisticated technologies, such as optogenetic circuits and genetic logic gates, and may lead to increased programmability of cellular electron flux. Traditional synthetic materials lack the innate ability to communicate with and respond to their environment compared to biological systems. In an effort to program “living” function into such materials, our lab rewires bacterial metabolism to control abiotic material properties. 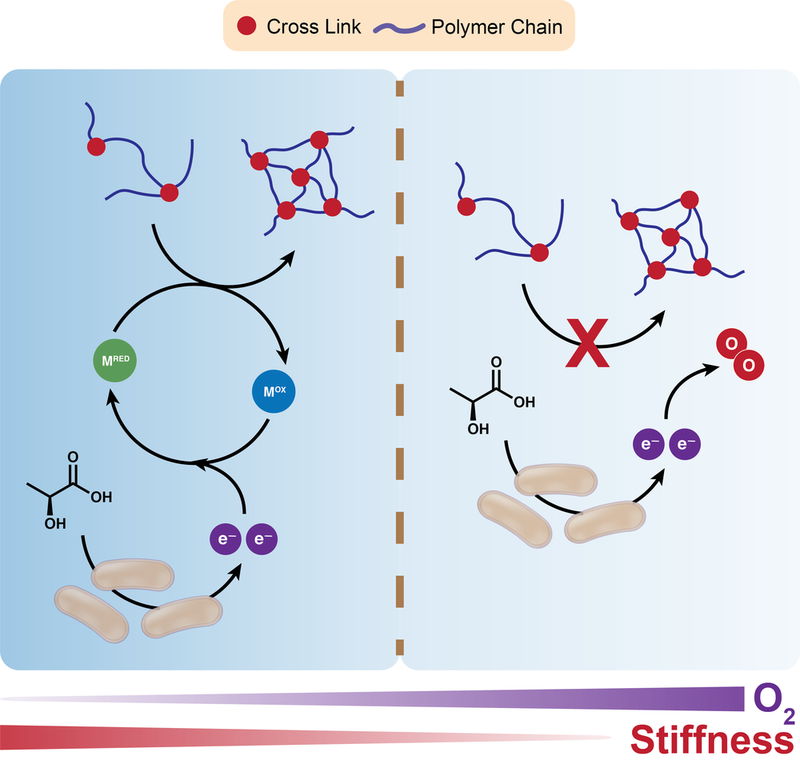 For example, we’ve demonstrated that leveraging EET can direct bioorthogonal polymer synthesis by governing the redox equilibrium of a metal catalyst. This mechanism can be generalized to other reactions such as the formation of hydrogels. Polymer and hydrogel characteristics, such as molecular weight, polydispersity, and crosslink density are a function of anaerobic respiration and governed by specific electron transport proteins. Combining our expertise in synthetic biology and materials science, we are coupling EET to environmental cues and spatiotemporal inputs to endow engineered materials with the responsiveness and adaptability of living systems. These living materials show promise as platforms for green material synthesis, biosensing, and tissue engineering. EET allows microbes to reduce soluble metals and insoluble metal oxides. Through this mechanism, simple metal salts can be converted to metal nanoparticles. These particles show promise as catalysts for processes relevant to water treatment, environmental remediation, and medicine. In some cases, they exhibit superior activity to nanoparticles synthesized using more traditional methods. However, control over nanoparticle size and crystal morphology is still a challenge and varies significantly between organisms. 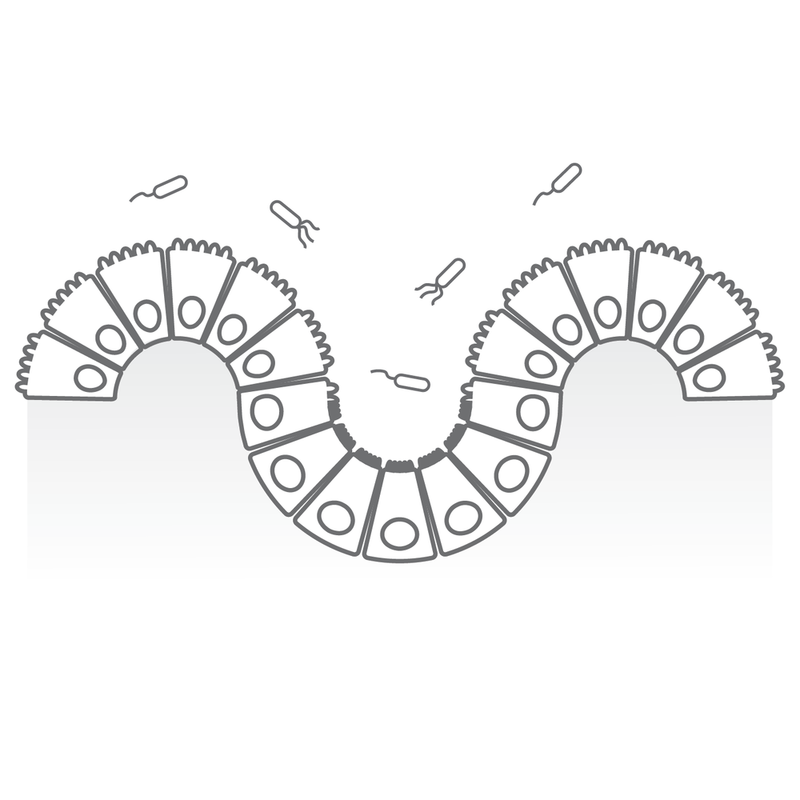 Well-defined genotype-phenotype linkages must be established to realize microbial production of designer materials. Towards this goal, we engineer the electroactive metabolism of S. oneidensis to better understand the mechanisms of bio-nanoparticle formation. Metal organic frameworks (MOFs) are a class of materials applicable in catalysis, gas storage, and environmental remediation due to their highly porous and tunable nature. In contrast to the metal oxides typically studied using electroactive bacteria, the structure and function of MOFs can be readily varied by changing the identity of the metal node and organic linker. We’ve demonstrated that EET enables S. oneidensis to metabolize MOFs made of particular building-blocks. We exploited this relationship to develop a chemical degradation platform that capitalizes on the synergy between bacterium and material effects, where adsorption and catalytic properties are enhanced relative to either component in isolation. We are applying this system towards the remediation of various environmental pollutants and toxins, including organic and heavy metal species. More broadly, we are exploring the use of MOFs as tunable growth materials for the study and application of electroactive organisms. Metabolic engineering benefits from the tunable and tightly controlled reactions afforded by biological systems. The reaction space available to specific organisms can be expanded through directed evolution or the insertion of heterologous pathways, but is still relatively limited compared to synthetic chemistry. In an effort to expand the scope of biological catalysis, we are exploring EET as a general means to achieve metabolic control over exogenous transition-metal catalyzed reactions. As an example, we used the bacterium S. oneidensis to control a metal-catalyzed radical polymerization. Metabolic control over polymerization opens avenues for applying synthetic biology and cellular engineering techniques to produce molecules and materials with emergent properties. 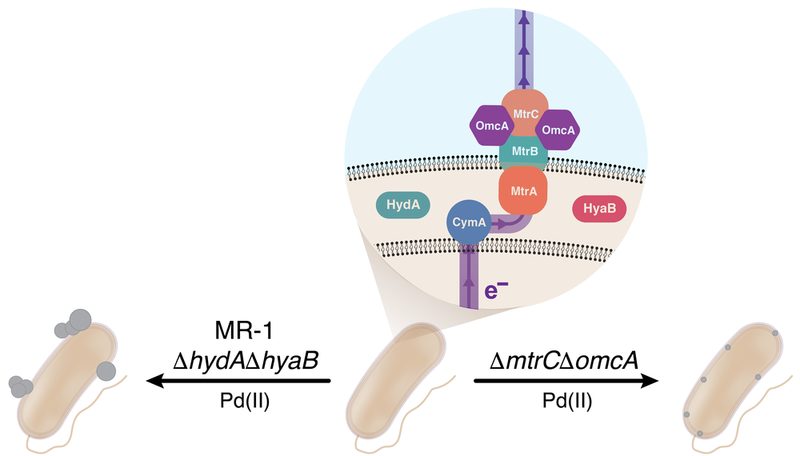 We are currently applying our expertise in synthetic biology and inorganic chemistry to expand metabolically-controlled redox catalysis to alternative electroactive bacteria and synthetic reactions. Oligomers and fibrils (amyloids) formed from several proteins are associated with a variety of neurodegenerative diseases including Alzheimer's, Parkinson's, Huntington's, and ALS. Unfortunately, for many of the proteins involved in these diseases, the mechanisms responsible for amyloid formation and the structures of various intermediates (e.g. oligomers and protofibrils) along the fibrillization pathway are notoriously difficult to study. This is especially true of oligomeric species, which are difficult to isolate, metastable, and disproportionately toxic relative to higher molecular weight protofibrils and fibrils. The continued study of oligomeric species will require breakthroughs in structural biology as well as an improved understanding of protein homeostasis and fibrilization kinetics. We are developing tools that will aid in the isolation of neurotoxic protein oligomers with the ultimate goal of establishing structure-function relationships for these species.